Remember the first time you squashed a Goomba with your boots? Or, the first time you touched a Fire Flower or Super Star, and saw what those new powers could do? It may have just been in a video game, but those are still game changing occasions in anyone's life. But if you hop into this Deluxe Mario Costume, you can relive those classic gaming moments in the real world! Saying that our daily lives would be much different if the world were like Super Mario Bros. would be a giant understatement. Just taking a casual stroll in the park would be packed with danger, with Koopa Troopas popping up out of nowhere and wrecking your good time. At least we'd also get to take advantage of all those awesome power-ups. If only solving problems in the real world were as easy as eating a mysterious mushroom and doubling in size, or grabbing a flower so you could fling fireballs out of your hands. But, just because flowers don't give you fireball powers, and rideable dinosaur sidekicks don't hatch out of giant eggs, it doesn't mean you can't dress up like everyone's favorite hero plumber and have a super adventure of your own! 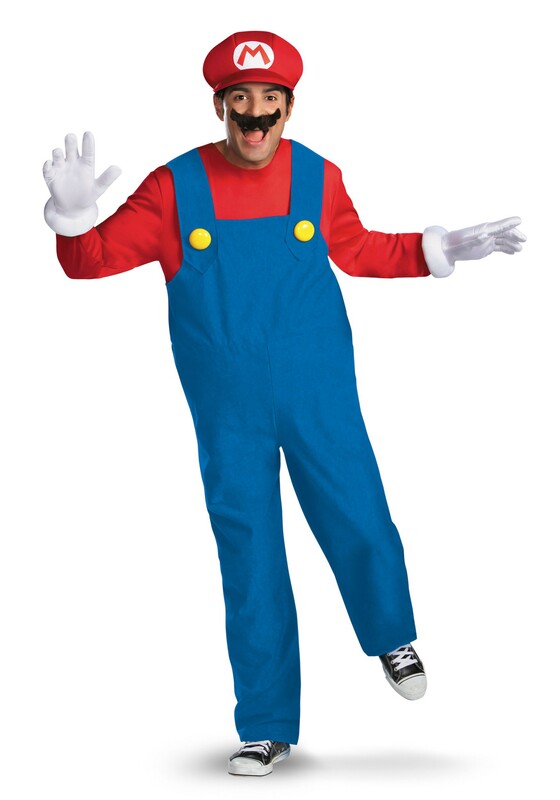 This deluxe official Nintendo costume comes with everything you need to look like Mario (no power-up required! ), from his famous overalls and cap, to his curled up mustache and white gloves. It even comes with an inflatable belly, so you don't have to carb-load on pasta to give yourself Mario's trademark paunch. So suit up, stomp on some wild mushrooms while pretending they're Goombas, and relive those Mario-memories in the real world.